Induction and Patterning of Embryonic Skeletal Muscle Cells in the Zebrafish, P.D. Currie and P.W. Ingham. Myogenic Regulatory Factors, S. Watabe. Myosin Expression During Ontogeny, Post-Hatching Growth and Adaptation, G. Goldspink, D. Wilkes, and S. Ennion. Muscle Satellite Cells in Fish, B. Fauconneau and G. Paboeuf. Cellular Mechanisms of Post-Embryonic Muscle Growth in Aquaculture Species, A. Rowlerson and A. Veggetti. Genetic and Environmental Determinants of Muscle Growth Patterns, I.A. Johnston. Muscle Fiber Diversity and Plasticity, A.M. Säer and W. Stoiber. Hormonal Regulation of Muscle Growth, T.P. Mommsen and T.W. Moon. With the advent of zebrafish as a model system, the development and growth of muscle in fish has become an ever more important process. 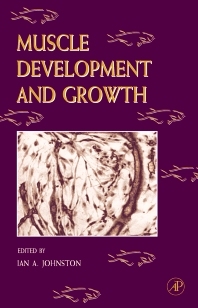 This volume, in the continuing Fish Physiology series, focuses attention on muscle from the genetics of muscle development to application of muscle growth patterns to aquacultural production. Graduate students in fish biology, aquaculture, and developmental biology; fisheries biologists, physiologists, and ichthyologists interested in an up to date review of muscle growth and development; research laboratories in governement fishery departments; and libraries.